About 62 percent of all U.S. households have at least one pet. Our dear animal friends can be tough on some types of floors. The biggest problem with pets is their nails. If the nails are not trimmed, they could scratch a laminate or hardwood floor. Most pets also shed and some are prone to accidents. Keeping a house with pets clean need not be a challenge. You can have a beautiful floors and also keep the family pet! 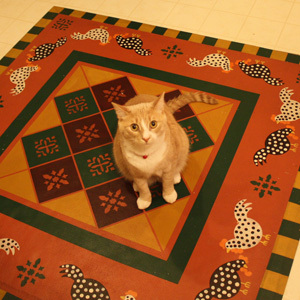 Unlike a carpet and area rugs, floorcloths do not collect hair and dust and are easy to clean. Design Village Floorcloths are scratch and stain resistant. Vacuum regularly and use a damp mop to keep it clean. 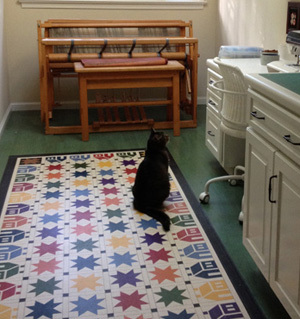 Our pet owner clients have consistently expressed full satisfaction using Design Village Floorcloths in their homes. Some have replaced their area rugs with our floorcloths. These are our customers comments after installing Design Village Floorcloth. Wonderful work! My cats have had a very funny reaction to the floorcloths. They actually don't walk on them at all, but instead, tiptoe around the edges. It is funny to watch and I have no explanation for their behavior. I have had an atrocious problem with them in the past because they seem to think small area rugs are their litter boxes. I was hoping the floorcloths would solve that problem, and they definitely have. We love our floorcloths! I have several dogs, and sometimes litters of puppies in my home. I have tile and wooden floors in the house accented with floorcloths. These have held up remarkably well. You don't have to worry about getting to their "mistakes" right away. I highly recommend Design Village Floorcloths.